Railway maintenance and construction is a huge investment and a big risk for a track owner and operator to continue running smoothly. Which is why choosing an experienced, trustworthy, and knowledgeable partner is essential to the success of your upcoming railway project. Whether you need to make repairs to your existing track, install new signals or require consultation on a new structure, the right railway contractor will have the experience and resources to make the process stress-free. For the past 10 years, Remcan has worked with clients, large and small, who have seen the value of what a solid partnership in the railway business can do. Every client has specific job requirements, where some decide to work with a single provider who has all the expertise and resources available. Others decide to work with multiple providers. Either way, there are a lot of decisions to be made in order to find the right fit. In an effort to save you time and resources, we decided to pool our knowledge of the subject into a helpful guide that outlines you what you need to consider before choosing a railway contractor for your upcoming job. One of the most important areas to take into consideration is response times. It sounds fairly straightforward but we want to reinforce how important it is to have a knowledgeable, responsive vendor to answer your call when you have a need. Managing a railway operation can be unpredictable at times, so a prospective partner should be able to provide assurance that they are available at all times, with the resources required to handle a crisis. Make sure to ask for client examples and processes they have in place for managing emergencies. Another factor to consider is centralized accountability. In other words, is it better for you to work with one contractor or multiple contractors to complete your project requirements? We recommend you do a quick analysis of your current and future projects and find a provider with the resources and skills to manage everything. In our experience, it’s a lot easier to adapt to change when the partner you are working with has a complete understanding of your business operations, your projects, and your goals. As one of the only major industries responsible for their own maintenance and improvement projects, we believe that it is our responsibility as railway service providers to maintain the highest standards of quality, safety, and efficiency. In order to ensure the railroads continue to successfully move carloads and intermodal units across North America, do your due diligence and hire a railway construction and maintenance provider who can keep your tracks up to par, expertly execute your construction projects, and get the job done right. 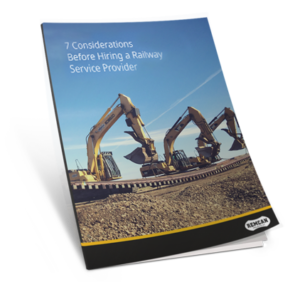 Download our guide, “7 Critical Considerations When Selecting a Railway Maintenance Provider” for more tips on what to look for before choosing a railway contractor to work with. We hope these guidelines will help you in your decision! Looking for a new railway contractor? Talk to our team to learn more about how we can meet your specific job needs.